The Chevy Silverado is going bigger in 2020. The biggest change involves towing capability, which has increased 52 by percent over the 2017 Chevrolet Silverado HD. 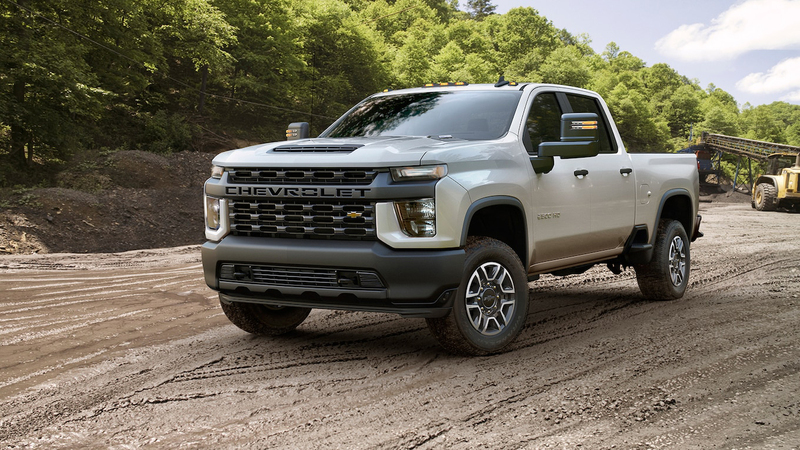 The 2020 Silverado has a towing capacity of up to 35, 500 pounds which is slightly more than the new 2019 Ram Heavy Duty at 35,100 pounds. With an increase in towing it will be interesting to compare the towing capabilities as they relate to the powertrains under the hood of the new Silverado HD. The base engine is a new, 6.6-liter, direct-injected Vortec V8 rated for 401 horsepower and 464 lb-ft of torque. That beats the outgoing truck’s base 6.0-liter V8, which was good for 360 hp and 380 lb-ft. The new 6.6-liter is paired with a six-speed automatic transmission. If the customer decides on the upgrade option there is a Duramax 6.6-liter turbodiesel V8, which is rated at 445 hp and 910 lb-ft. The new RAM HD is offering 1,000 lb-ft of torque with its diesel engine. Still, the Duramax is now mated to a new Allison 10-speed automatic transmission, which helps it bolster the aforementioned towing ratings. Chevy engineers bulked up all the critical components needed for the Duramax to tow 35,500 pounds. Compared with last year’s HD trucks, the new models’ boxed ladder frame is tougher, the axles are larger, the prop shafts are enlarged and even Duramax’s cooling fan has increased by 2.5 inches in diameter. Along with a larger towing ability, Chevy also supersized the Silverado HD all around. The bed got a major upgrade as it does not share its box with the 1500 models. The standard box has a 6.7 inches more “usable width” and is 3 inches longer, while the long box (8-foot) is now 0.5 inches longer. Of course, Chevy couldn’t let the opportunity pass to make those boxes easier to use. The lift-over height is now almost an inch lower than before, and the box sides have been lowered for easier fifth-wheel trailer towing. The CornerSteps that help users clamber up to the bed are larger too, they are able to accommodate a size-12 boot and tough enough to support 500 pounds of weight. Don’t think the truck’s cab got left behind. The Silverado HD Crew Cab models now ride on a 5.2-inch longer wheelbase and boast a 10.4-inch longer length with a 1.4-inch wider width. That allows for about 3 inches more cab length, Chevy says, contributing more to the interior room. The 2020 Chevrolet Silverado HD also has a brand-new design on the outside. This Silverado HD has more differentiation from the 1500 model than ever before, with only the roof panel shared between the trucks. That massive front grille can optionally be equipped with active shutters, too, to help reduce drag and thus boost fuel efficiency. Chevrolet’s data show that 90 percent of its heavy-duty truck buyers use their vehicles for towing, so it’s no surprise the automaker has included lots of high-technology to make that simple and to make it safer, bundled under the brand name Advanced Trailering System. The Silverado HD can be equipped with cameras that provide up to 15 different camera views, including an accessory camera mounted to a trailer that allows drivers to “see through” what they are towing. The Silverado HD is compatible with a Trailer App that allows you to verify lights, tire pressures, and other critical check-ins before setting off with a trailer. Each truck is also a customized Trailering Information Label, which reveals that specific model’s curb weight, gross vehicle weight rating, gross combined weight rating, maximum payload, maximum tongue, and gross axle weight ratings -- basically, all the information you’d want to know before using your vehicle. Other tech features include Park Grade Hold Assist, which can use all four of the truck’s service brakes (instead of just using the parking brakes) to keep the truck and trailer in place on a slope. The truck will stay in Tow/Haul mode if it was driven in that mode within the prior four hours. A new after-run feature helps automatically cool down the Duramax diesel when necessary. We won’t have to wait long for this vehicle to be out on the roads but until then make sure to stay up to date with new automobile technology by following NowCar on social media.